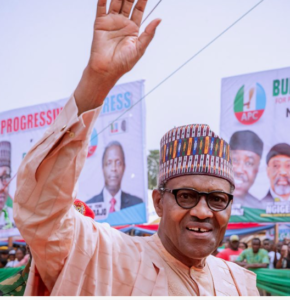 Mr Emmanuel Jime, the governorship candidate of the All Progressives Congress (APC) in Benue said the high percentage of votes won by President Muhammadu Buhari across the state has confirmed his popularity with the masses despite the campaign of calumny against him (Buhari) and the APC. Jime told Newsmen on Wednesday in Makurdi that despite the alleged irregularities, the president polled 347,668 votes to win in 10 local government areas of the state. “I think for us in Benue, the elections and the votes actually demonstrate that Benue has repudiated the campaigns of calumny and propaganda and has taken a pathway to align itself with national thinking of our country. He commended the people for turning out in their large numbers despite official falsehood and lies against the president and the APC to exercise their franchise. “Your vote was a vote for development,” he assured. He condemned those politicising the insecurity to score political goals in the state and advised those seeking political offices to find better ways of tackling problems rather than feasting on the misfortunes of others. Jime, a former speaker of the Benue House of Assembly and federal lawmaker, said he was not opposed to the anti-open grazing law but was concerned with the manner of its implementation. He said he would strengthen the law to make it commercially viable to the state where the Federal Government would also be a partaker. He regretted the huge political upsets suffered by the party in the last election but said that would not dampen the chances of it winning the governorship on March 9. “My chances of winning the governorship are bright, as you can see, I am cool and calm, the person that should be worrying is Gov. Samuel Ortom; he should be having sleepless nights. “This election is a referendum on his performance, hopefully by the pattern of voting. There can be no choice as stark as this one,” he said. This is a mans sandwich! For the previous 8 years we couldn’t have one. A douche with two slices of bread doesn’t make a sandwich!